Chelsea have indicated interest in signing Sanchez, even though it is widely reported that Arsenal and Man United have reached an agreement. There is a new twist developing in the last couple of hours today 15th January on the transfer of Alexis Sanchez. As widely reported yesterday that Man City was unwilling to pay the fee demanded by Arsenal, it is now confirmed that City has pulled out officially. manchester City is of the view that a player that would cost nothing in little less than six months from now is not worth the asking price. Man United became favorite over the weekend since indicating readiness to better City’s offer on all fronts, and have moved swiftly to come through with the said numbers, but the very latest now is that Chelsea is seriously sniffing around and are ready to compete with Man United. 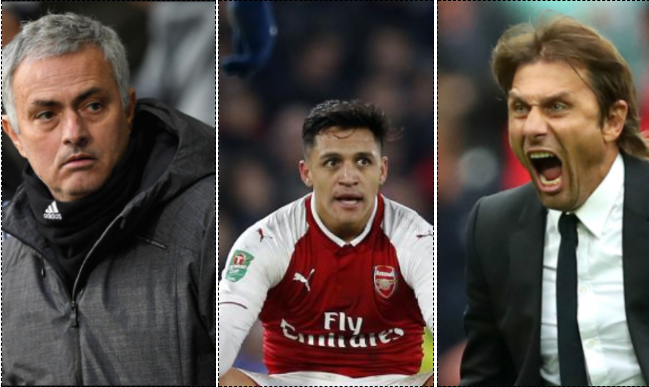 Antonio Conte and Jose Mourinho have both been involved in media spat recently, rivaling each other on Sanchez may likely spark a new row, but most interestingly for Arsenal is the chance of pushing the fee on Sanchez. Should Chelsea interest be considered serious, this will push back the early resolution of Sanchez transfer. Henrikh Mkhitaryan is part of a proposed swap deal but multiple reports have it that he is reluctant to move to Arsenal and he is, in fact, the one holding up the deal between Arsenal and Manchester United.